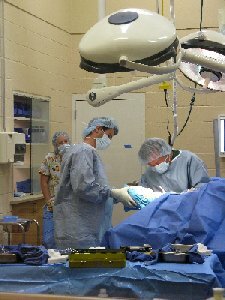 Our board certified surgeon Dr. Kent Sullivan performs soft tissue surgeries (mass removals, tendon/ligament and throat surgery, etc), orthopedic procedures (fracture repair, arthrodesis, sequestrum removal, etc), abdominal (colic) surgery and arthroscopy ( OCD surgery, joint cartilage evaluation) well as a variety of surgeries. Laparoscopy and laser surgery for tumor and mass removal are also offered. Our fully equipped surgical suite has 2 induction/recovery rooms to more efficiently handle a busy surgical caseload. The surgical suite has state of the art anesthetic monitoring equipment and patient evaluation with hematology, chemistries and blood gases. The induction/recovery rooms are fully padded and patients are extensively monitored and assisted to insure a safe recovery. A special surgical viewing room and lounge is available for clients who would like to watch their horse's surgical procedure. Our board certified internist Dr. Deborah Kemper cares for gastrointestinal and abdominal diseases (ileus, nonsurgical colics, chronic and acute colitis (diarrhea), splenic and liver disorders, abdominal infections, respiratory diseases (guttural pouch infections, bacterial and viral upper respiratory infections and pulmonary disorders (pneumonia, COPD, airway inflammation) and a variety of dermatologic and ophthalmic disorders. Neurologic cases are fully evaluated with a neurologic examination, diagnostic blood and cerebrospinal fluid evaluations, and radiographs. Our hospital has a special stall to safely unload horses that are down in the trailer. 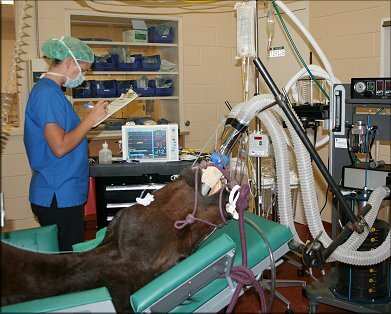 This stall is also equipped with an overhead hoist in order to place unstable horses in a sling to decrease risks associated with recumbency and improve their quality of care. Neonatal diseases are especially challenging and our hospital is equipped with two intensive care stalls where the foal can be physically separated from their mares but the mares can interact with the foals and not interfere with their medical care. These stalls are heated and air-conditioned and have viewing windows into the technician treatment room so they can be very closely monitored. West Coast Equine always takes a full team approach to all cases and especially colics and dystocias, since those cases are so critical in their need for timely attention and full staff involvement. We also consult routinely on ophthalmic, respiratory and gastrointestinal cases so that both a surgical and medical approach is thoroughly evaluated. Be assured that all staff members work together to provide the most thorough diagnostic and treatment approach to our cases. * Emergency services are available around the clock. The hospital is fully stocked and is ready to handle almost any type of equine emergency. With a wide parking lot with safe horse unloading area, a comforting reception/waiting area and the quick response of our veterinary and support staff, we understand an owners concern about emergency care for their horses. *Our on site laboratory allows a complete diagnostic evaluation which will better able the veterinarians and owners make the best emergency treatment decisions. We understand how emergency cases may involve complex medical and surgical procedures and we strive to explain to the owner about the varied options of care available so they make a fully informed decision. * Our hospital offers top of the line gastroscopy and endoscopy procedures. 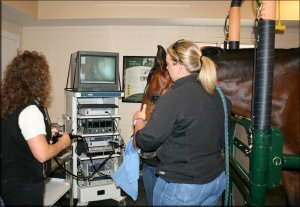 Our video endoscopy provides excellent evaluations of horses that may be suffering from gastric or esophageal ulcers, upper airway obstructions or abnormalities, ethmoid hematoma exams and treatments, and urinary tract disorders. Owners and trainers are welcome to view the procedures so they fully understand the nature of their horse's problem. * A high quality 1000mA radiograph machine is used for obtaining diagnostic radiographs of several problems areas that are difficult to evaluate with a portable radiograph machine. Common uses of our in-hospital radiograph machine are evaluations of skull, thorax (lungs), cervical, thoracic, and lumbar spine, abdomen, pelvis, shoulder, elbow and stifle. All these images have the excellent quality of digital imaging and can be sent via email or CD to referring veterinarians. * Isolation stalls are available for separation of horses with possible contagious diseases from the rest of the hospitalized patients. Our doctors and technicians wear special attire for entrance into the isolation area and most all equipment and supplies are kept entirely separated from the main barn. Horses confined to the isolation stalls are allowed in their own walking and grazing area that is separate from other hospitalized patients. 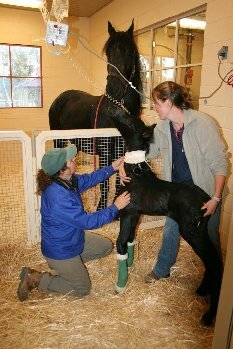 * Foaling out normal mares and mares with high risk pregnancies are an important service that we provide to our clients. Mares are examined multiple times a day, milk tests may be performed to determine proximity to foaling, ultrasound evaluations of the foal and placenta are available as needed, stall cameras are employed to insure round the clock monitoring and a veterinarian lives on the premises to evaluate and monitor the foaling. A Foal Alert system is also utilized that will activate an alarm when the mare starts foaling. Mares are kept as comfortable as possible with stall or paddock stabling, daily walks or turnout, daily grooming and maintaining their diet as consistent as possible. After foaling care is very important and includes examination of the placenta, monitoring/assisting the mare/foal bonding, foal standing and nursing, foal meconium passage and umbilical care. A complete neonatal examination will be performed including evaluation of the IgG with a blood test. All recommendations for post-partum mare and new foal care will be outlined for our clients when the pair are ready to go home. 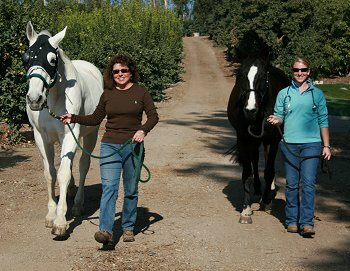 West Coast Equine accepts out-patient appointments for most equine veterinary care procedures. Lameness and pre-purchases exams are routinely performed at the hospital since those appointments may have a significant time involvement and may require numerous diagnostics that often can be performed during the same appointment. Also, extensive evaluations may require additional treatments that are likely to be completed during one visit. Our out of town clients find it convenient to bring their horses in and have yearly exams, blood work and preventative medicine completed at one appointment visit. Dentistry procedures, Coggins/health certificates and vaccinations are also available as an out-patient appointment.